Portuguese gastronomy This work was made by: Ana Rita Lambelho Joana Morcela. 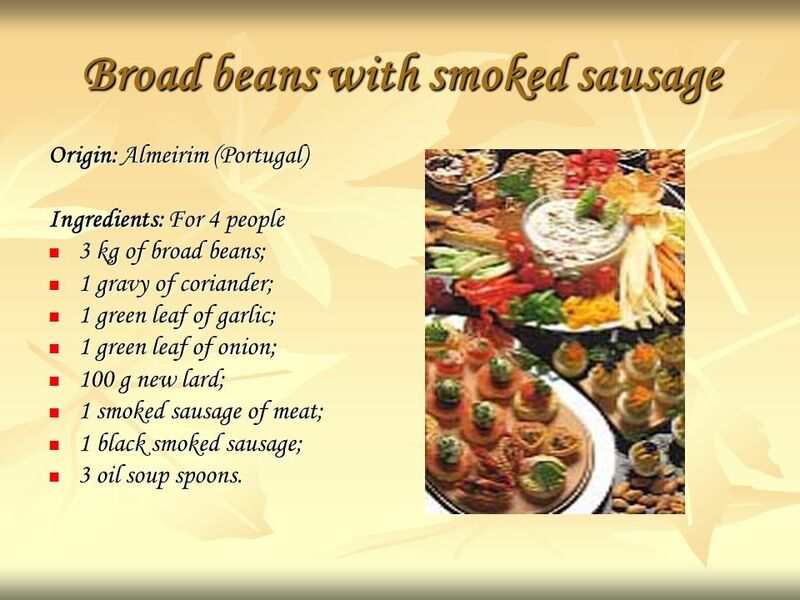 2 Broad beans with smoked sausage Origin: Almeirim (Portugal) Ingredients: For 4 people 3 kg of broad beans; 1 gravy of coriander; 1 green leaf of garlic; 1 green leaf of onion; 100 g new lard; 1 smoked sausage of meat; 1 black smoked sausage; 3 oil soup spoons. 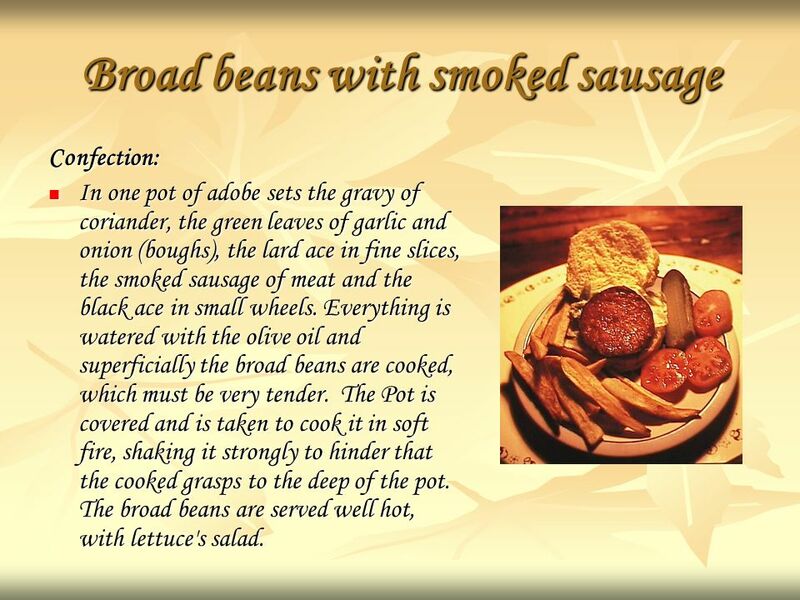 3 Confection: In one pot of adobe sets the gravy of coriander, the green leaves of garlic and onion (boughs), the lard ace in fine slices, the smoked sausage of meat and the black ace in small wheels. Everything is watered with the olive oil and superficially the broad beans are cooked, which must be very tender. The Pot is covered and is taken to cook it in soft fire, shaking it strongly to hinder that the cooked grasps to the deep of the pot. The broad beans are served well hot, with lettuce's salad. In one pot of adobe sets the gravy of coriander, the green leaves of garlic and onion (boughs), the lard ace in fine slices, the smoked sausage of meat and the black ace in small wheels. Everything is watered with the olive oil and superficially the broad beans are cooked, which must be very tender. The Pot is covered and is taken to cook it in soft fire, shaking it strongly to hinder that the cooked grasps to the deep of the pot. The broad beans are served well hot, with lettuce's salad. 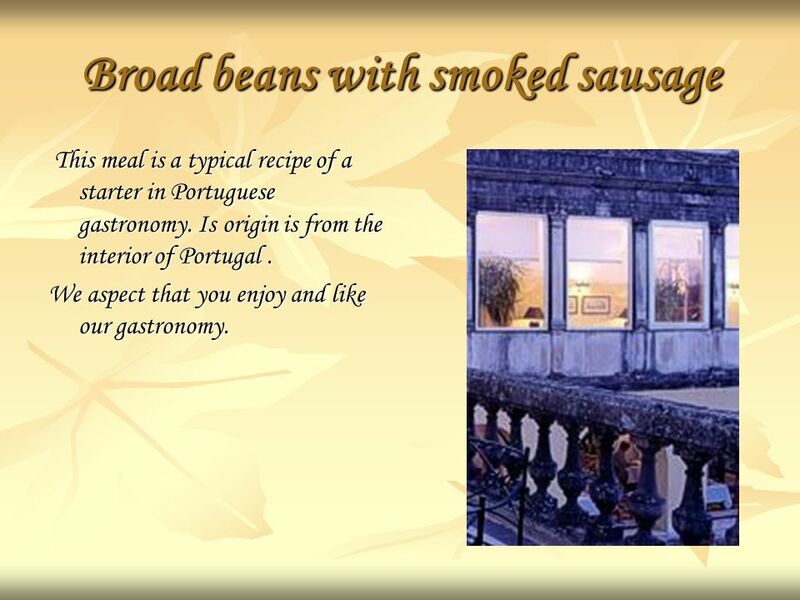 4 Broad beans with smoked sausage This meal is a typical recipe of a starter in Portuguese gastronomy. Is origin is from the interior of Portugal. This meal is a typical recipe of a starter in Portuguese gastronomy. Is origin is from the interior of Portugal. We aspect that you enjoy and like our gastronomy. 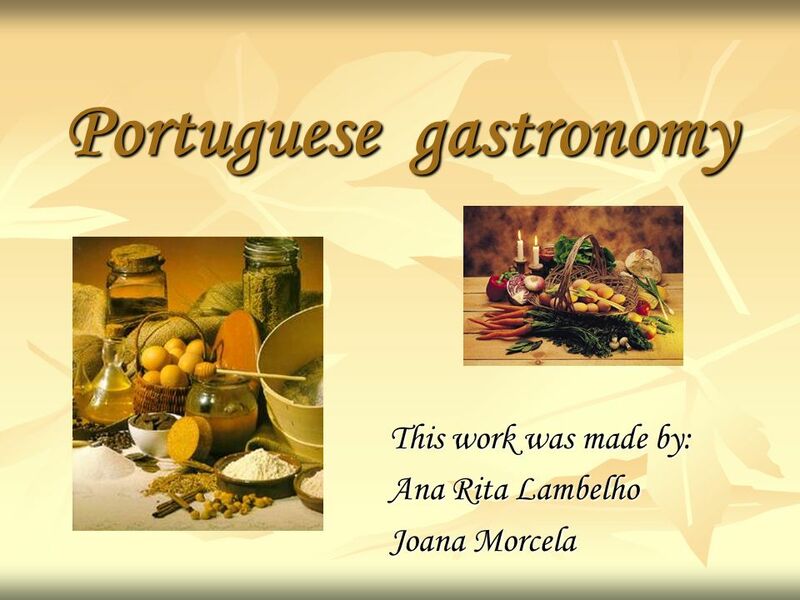 Download ppt "Portuguese gastronomy This work was made by: Ana Rita Lambelho Joana Morcela." Sopa da Pedra (Stone Soup) Portuguese Traditional Gastronomy. Christmas Soup. Christmas Soup This is a soup that we, in Portugal, usually eat all year, but in christmas this soup becomes special, with more ingredients. The Portuguese Snails Francisco Ferreira João Vinha. The Traditions Of The Christmas Eve This work had been done by: Ana Rita lambelho, nº1 Joana Morcela, nº9. Arroz con Leche Tamales Flor de Itabo Picadillo de Papaya Olla de Carne Picadillo de Arracache Chorreadas Tamal Asado Casado Gallo Pinto. Project Comeniu s Základná škola s materskou školou Budimír. Made by: Aleksandra Leśniewska 6 b class. „Gołąbki” are traditional dish of Polish cuisine with Lithuanian origin. „Go łą bki” are made with big leaves. Bulgarian Traditional Cuisine Viana de Castelo – Portugal 19May May 2014. Beany Burgers with Corn & Apple Relish. Relish ingredients: 1/2 a red pepper and 1/2 a green pepper, deseeded and finely diced, 2 salad onions, 1 diced. Slovak traditional food Sauerkraut soup (Kapustnica) Martin Šulan 9.B- 15 years. TRADITIONAL DISHES AND FOODS IN PALENCIA AND ITS REGION. CHRISTMAS MENU 1, FISHERMAN’S SOUP 2, STUFFED CABBAGE 3, BEIGLI.